These are very versatile two -in- one lifter which is operated by only one person. It can take on iteself a barrel lying on the floor, carry it to any place in the premise on pucca floor. Lift is to the required height upto 2 mtr. and tilted, so that its contents may be poured into a vertical barrel/tank. 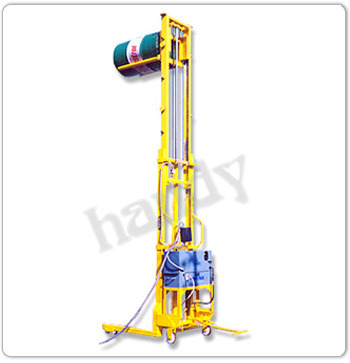 It is a hydraulically operated machine. This equipment is very compact occupying minimum floor space but highly maneuverable. It is also used for stacking, loading and unloading drums from trucks. 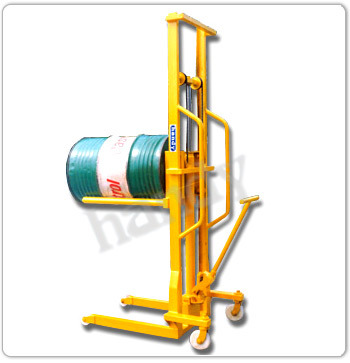 The drum lifter is also available in electro Hydraulic Lifting & battery hydraulic lifting version. Capacity One Barrel 250 Kgs. Capacity One Barrel 350 Kgs.